June is almost over, which hardly seems believable. Though summers can be packed full of fun activities, it’s also a great time to network or search for a new job! Happy hours are a great time to hit the patios and network with new people – you never know where your next connection will come from. It might just open the door to your next career move! In light of that, here are a few open positions now – many of which don’t require any prior experience! Community Support Associate at Khan Academy: Khan Academy is an online education non-profit, with resources for learners of all ages. They’re looking for a community support associate to interface between employees and students. The job description reads a lot like the duties I have at work, and I love working with people in a tech environment and making things more accessible! It’s a full-time position and while Khan is based in Mountain View, CA, they are remote-friendly! Senior Writer at Aha! : If you have experience as a product manager, Aha has quite a few available positions. The Senior Writer works with the rest of the marketing team to create high-quality content for their road mapping software. B2B and SaaS enthusiasts would really dig this company, who is working to create a distributed team. Customer Support Executive at Close.io: This sales software is looking to add to their customer success team. 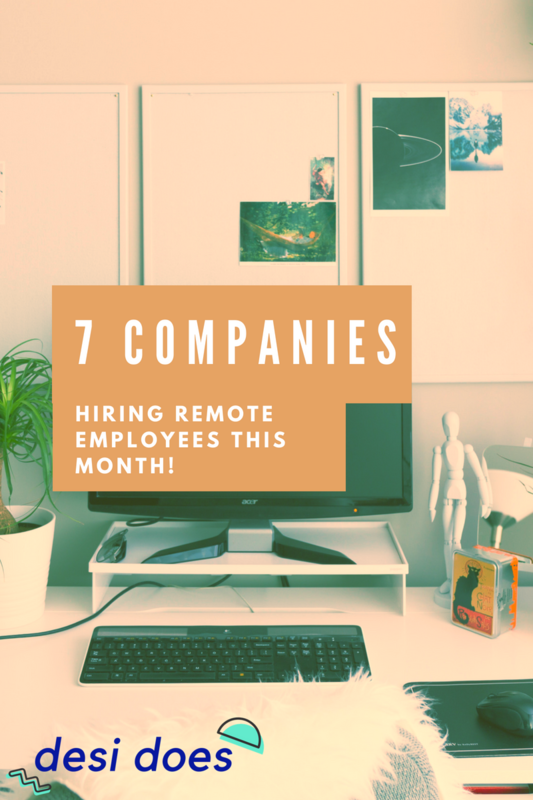 The remote company is looking for someone to work with customers via email, phone, chat, and screen sharing to resolve issues. Glassdoor features high reviews from current and past employees, and they offer excellent benefits, including two retreats every year! People Operations Specialist at Plex: Plex is one of my favorite discoveries of the year – it’s a remote media server you can set up, so you can access things like your music, TV shows, movies, or other media wherever you are. They’re hiring now for an HR specialist, so if you have a background in hiring and managing staff, this could be a great opportunity to move to a remote tech company. Customer Advocate at Buffer: Buffer is one of the leading social media management software programs, and seems like a hugely popular company to work for. They’re looking worldwide for someone who fits with their company values to work with customers to get the most out of their Buffer membership. It looks like a pretty long application process, but it looks like they’re very communicative about the process! General Night News Writer at Elite Daily: If you like breaking news, this after-hours position could be for you. Elite Daily is growing their news team, and they’re owned by the Bustle Media Group now. Since the acquisition, the quality of content has really gone up, and they aren’t just a content mill anymore – this is a great opportunity to join a well-established publication as a staff writer. Event Manager at InVision: InVision is a UX design software, and they’re looking for an Event Manager to represent them at conventions and conferences, as well as design and execute InVision events. If you have a background in event management, are willing to travel, and want to work with an exciting virtual UX company, check this position out today! I’ve been super lucky to have been working remotely for almost five years now, and I think I’ve gotten it down to a pretty productive science. There’s definitely a lot to be said about creating a workspace that is comfortable for you, but not getting too comfortable. Through a lot of trial and error (and too many days working from my bed,) I thought I’d share some of my most-used products and setups for getting the job done! I really like ambient background noise, which is funny, because usually that kind of noise pollution while I’m at a coffee shop or something will make me crazy. Ambient-mixer is one of my favorites, but when I’m really struggling to focus, I bring out the big guns: Brain.fm. It’s an AI composer with music and sounds that help you focus, relax, or even sleep. The Beach Focus station is constantly on repeat for me, and I always feel hypermotivated when I have it playing. Not sold on scheduling breaks into your day? Watch this video from Marisa Mohi on how scheduling breaks and sticking to them is an important part of self-care. Honestly, a dedicated workspace doesn’t even need to be fancy – it can be your kitchen table or a desk in your bedroom. Being in that space is a good physical symbol for your brain that now it’s time to work. Find a desk that you love (or pop on craigslist to find a cheap one and do a DIY revamp so it becomes a desk you love,) and outfit it with things you want to be surrounded by. A vision board of inspirational quotes or your dream vacation, a candle of your favorite scent, and easy access to your favorite pens – whatever it takes to make it a space you like to spend time. I like a really simple, empty desk – otherwise, I won’t want to sit there. The file organizer that sits on my desk was $1 at Target, as was the wall calendar I have tacked up. I’ll rotate candles out with the season (I’m currently loving Bath & Body Works’ Salt Flower, thanks Dani.) Other than that, there’s not a lot of clutter on my desk. Another thing that can help you get out of bed or off the couch and over to your desk is a mug you love that’s for work only. I have a giant one from my old arena that I love, and I only use it when I’m working at my desk. 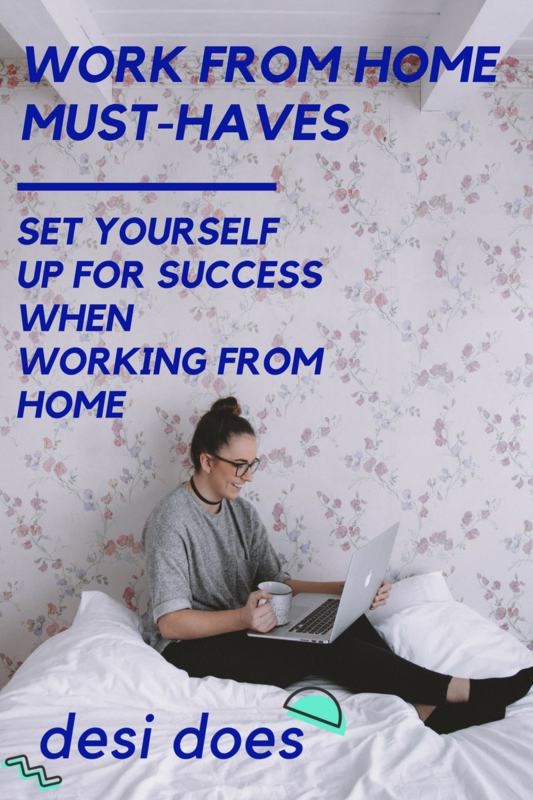 It’s important to keep a water bottle nearby too – when I moved from an office to a home office, I was constantly dehydrated because I wasn’t drinking water at all. My favorite is this Contigo one, which keeps drinks cold for hours. Get dressed. I hate this as much as the next person, but to be honest, my work uniform isn’t even that fancy. I get up, put on a sports bra and workout shirt along with workout capris, and call it a day. The act of changing out of my pajamas is all I need to get the creative juices flowing. You could even change out of sleep clothes into sweats – as long as it works for you. This could also be the start of a morning routine – another way to slide into your workday. Get up, maybe do some yoga, start the coffee machine, make breakfast, take your vitamins, say some daily mantras – it’s a good and gentle way to transition from sleep to work. Lastly, it’s important to have a place to escape to. Luckily I have the option to enjoy my outdoor patio office (since I live in Chicago, I get to do this for about two weeks a year, but still) but sometimes being home at all is too much of a distraction and it’s time to get out of the house. Or maybe the internet has gone out for the tenth time in a day and you can’t deal with one more router reset. Knowing what coffee shops nearby helps because some days you just can’t focus on the work at hand with all those distractions – or the power will go out, the internet goes down, or your neighbors decide that 9am on a Tuesday is the appropriate time to have band practice. Escape to the coffee shop for unlimited caffeine, camaraderie (there’s always someone else working in a coffee shop,) and internet connection. Do you work remotely? What are your home office must-haves or favorite products? We’ve finally strung together multiple sunny days here in Chicago, so I’m still pretty cautious, but I think I feel safe enough to say that spring is here. Something about the summer has always made it seem like it’s time for new beginnings – and maybe for you, that means a new job. 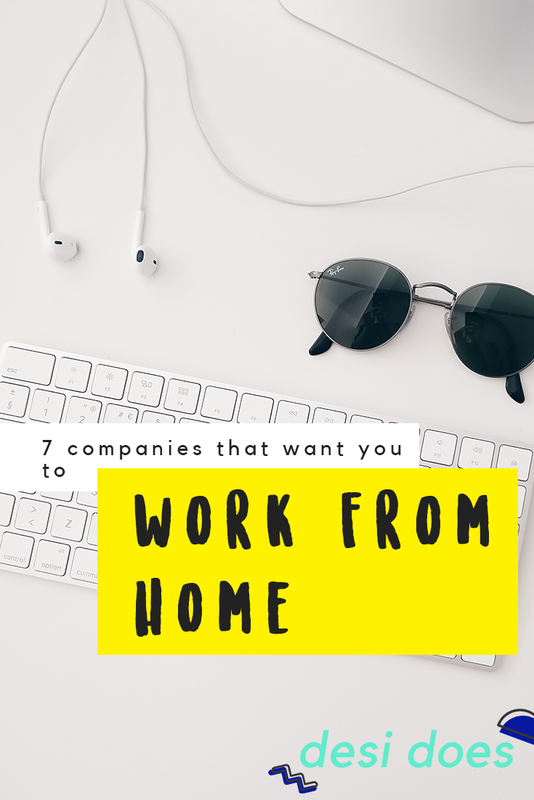 Here are seven current opportunities – many of them don’t even require prior remote experience! Fan Happiness Associate at Gametime: Gametime is a mobile ticketing platform, and they’re currently hiring in certain states. Preference is given to those with previous remote experience, or in a tech or live entertainment setting, but don’t let that stop you from applying! If you enjoy providing excellent quality customer service and solving problems (often time-sensitive), this could be the gig for you. Customer Support Associate at CareMessage: This company is a nonprofit that helps make healthcare more accessible to underserved or rural communities. As a CSA, you’ll help customers find answers, troubleshoot issues in the software, and work with the engineering team to implement user requests. They also have a clear 1/3/6 month plan for new employees, which helps to eliminate some of the stress and imposter syndrome associated with starting a new position. Knowing what the company expects from you helps a lot! Support Team Manager at Trello: I’ve long loved Trello, and their company culture sounds just as great as the product. Apply for this position to manage the support team, develop strategies to improve customer retention and acquisition, and manage daily operations, among other tasks. Customer Success Manager at monday.com: If you’re in the PST/MST time zone and have excellent self-management skills, this customer-facing role with Saturday hours could be a great way to launch a remote career. Lead Editor, Home Office at The Wirecutter: If you love home office tech gear and writing about it, this could be your “in” to work with the New York Times. They’re looking for an editor to manage and assign projects freelance staff, project manage content, and interact with the community. Sounds pretty cool for my gear-loving nerd head! Customer Success Specialist at TaxJar: I’ve been learning a lot lately about taxes, and that’s all due to TaxJar. If you have a retail background, some remote work experience, and very patient, this could be a great option for you to build your support resume! If you’re looking for freelance writing jobs, check out this post with tons of websites that pay for your submissions – or check out Contena, where you can search hundreds of new, legitimate writing and editing jobs every day. Developer Program Manager at GitLab: This tech company has a great reputation and reviews from employees. The program manager is responsible for growing the community of GitLab developers, working to improve open source contribution and work on educational programs. QA Analyst at Modern Tribe: If you like breaking things, finding mistakes, and getting them corrected before a product is shipped, QA might be the life for you. Apply for this position with Modern Tribe, a digital agency that creates some really cool campaigns and websites – QA can be a really great opportunity for employees looking to make a jump from support to dev. Release Manager at Analytics Fire: Always dreamed of being a rocket scientist… kinda? Analytics Fire builds software for companies in solar power, and that’s kind of the same thing. If you have a lot of experience in Ruby, Python, and React, the primary role of this position is communicating with clients to ensure smooth product launches. Growth Product Manager at Creative Market: I love Creative Market and download the free goods every Monday (click here for those!) They considering remote candidates from specific states for this position that works with departments across the company to implement ways to measure metrics and grow the userbase. Developer Evangelist at Twilio: Have a hardware product background but prefer to write about things, rather than create them? Twilio is looking for someone to create content for their blog and social channels, speak and volunteer at relevant events and conferences, and building partnerships with companies and developers. If I had the experience (and was at all considering leaving my position, which I don’t see happening ever!) this sounds like a great role. Web Developer at Pennsylvania State University: Penn State’s teaching department is looking for a developer with two years experience in Ruby. I see a position at a university and all I can think of is FREE EDUCATION, but, you know, maybe that’s just me and my desperate desire to go to grad school. Site Reliability Engineer at DuckDuckGo: DuckDuckGo is the search engine that protects users’ privacy – a pretty hot topic, considering. They’re looking for another engineer to keep the site online and stable including building updates and scoping new projects. I recieved products from NuShield and CoolerPad for review. All opinions are my own. Summer, summer, summertime. Just because you still have to go to work (which is totally unfair) doesn’t mean that you can’t enjoy the sunshine and weather. We have a great patio at our apartment and I couldn’t resist the urge to move my office outside this season. 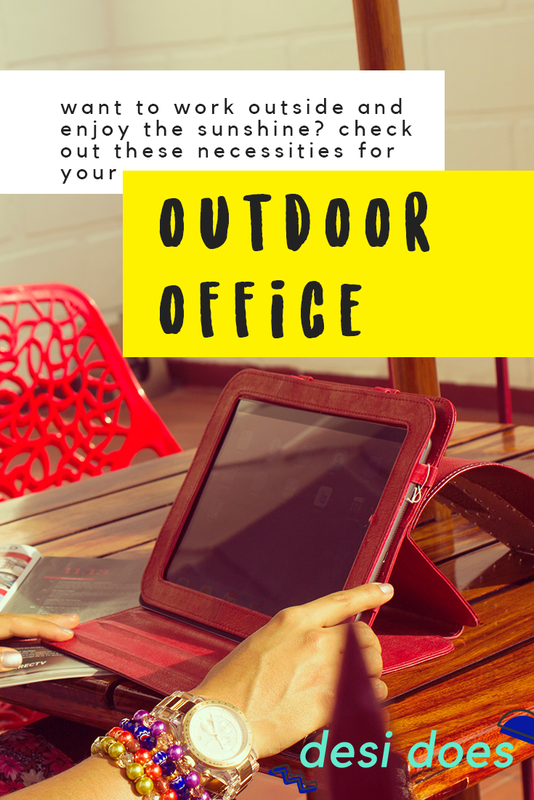 There are definitely some necessities you need specifically for an outdoor office – here are my must-haves for making the move away from the desk! An Eye Saver: Speaking of screen glare, something that has been a total game changer for me is the NuShield Dayvue Antireflective Screen Protector. It has solved a problem I didn’t even really know I had. Initially, I got it to help with the glare I was suffering with outside. Basically, I was only able to work outside in the mornings, and the sun was so harsh by the afternoon that even the umbrella couldn’t do enough. With this film, it’s possible to read my screen more easily outside and inside. Until I put it on, I didn’t realize how often I was squinting at the screen, causing tension and headaches. It was an easy application and though it suggests having someone help out on standby, I was able to apply it well on my own. You can even see in these photos how well it’s working: before I put the film on, and after! SPF… A Lot of SPF: With the extra time in the sun, you’ll want to be sure to keep your skin safe. My favorite facial sunscreen is still Block Island Organics facial moisturizer (yep, I’m still loving it.) Your body needs to be covered, too – Sun Bum is my favorite sunscreen for its cool coconutty scent. 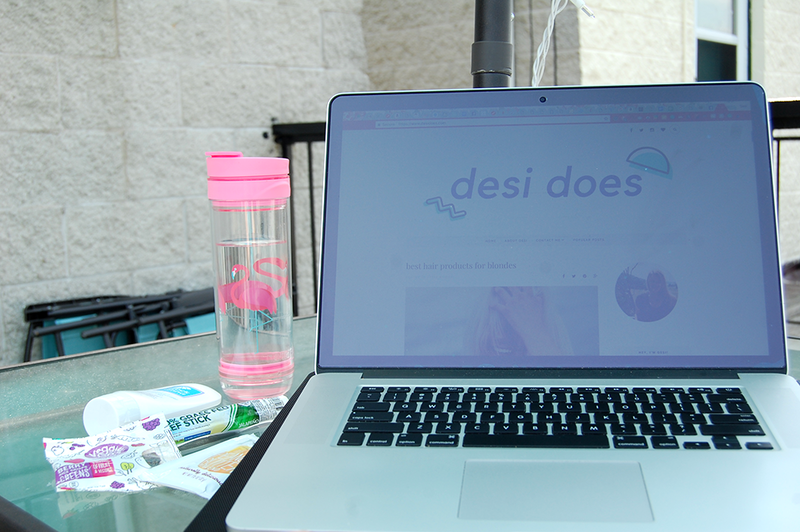 Laptop Air Conditioning: Your body isn’t the only thing that will heat up outside. Computers are also susceptible to heating up. I recently upgraded to a Cooler Master Notepal after using the ultra-slim model for years. It’s an external fan that will help keep your computer from overheating, helping with ventilation and even adding some ergonomics to your keyboard. Keeping your tools in working order is important in keeping the outdoor office working! I personally prefer the ultra-slim model because the Notepal doesn’t have anything to stop the laptop from sliding forward – it’s better for lap use vs. flat surfaces. Bug Repellent: I like to work into the night (and even if I’m not typing away, I’m probably out there with my nose in a book.) The bugs around us aren’t too bad, but I like a citronella candle on deck just in case they get overwhelming. Water, Water, Water: Even if you don’t feel it, you’re going to be sweating in that heat. Stave off dehydration or sunstroke by staying ahead on your H2O. I like Hydroflasks – they really do keep your water cool, even in 80 degree heat. If it’s hard for you to remember to drink a specific amount, get a Nalgene bottle and mark off times so you’re sure to be drinking throughout the day. Or, take a page from Dani’s bullet journal and add a water tracker to yours! Snacks: The best part, right? Keeping your body full is just as important as drinking enough water. Fruit salad is my favorite summer snack. A charcuterie board and cheese plate is also a really great option! Protein is also super important for energy – I really like paleovalley’s meat sticks and, of course, Justin’s Nut Butters. Do you work outside in the summer? 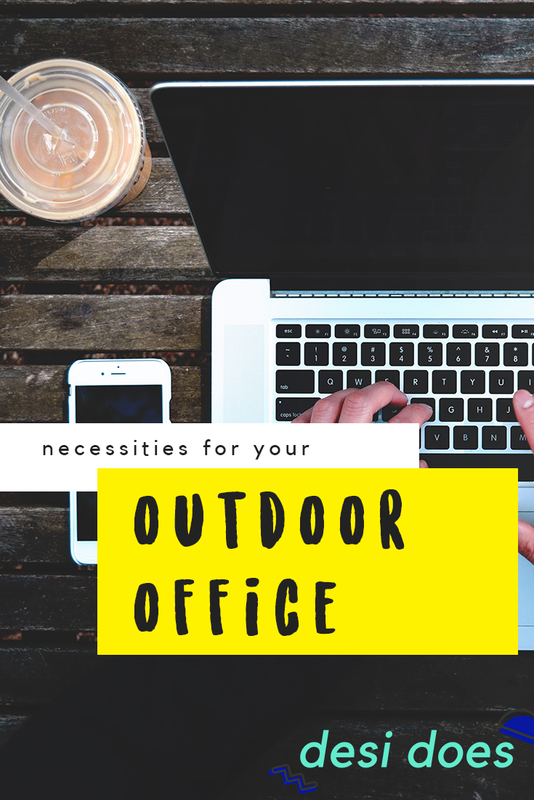 What do you bring to your outdoor office with you?